For R&B ensemble, see Five Flights Up. 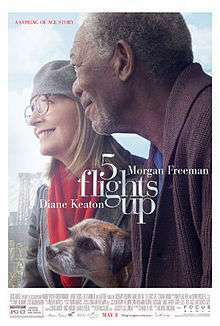 5 Flights Up (released in the United Kingdom as Ruth & Alex) is a 2014 American drama film directed by Richard Loncraine and written by Charlie Peters, starring Morgan Freeman and Diane Keaton. The film is based on the novel Heroic Measures by Jill Ciment. The film was released on May 8, 2015, by Focus World. Alex and Ruth Carver, an older couple, want to move because living in an 5-story walk-up is too difficult without an elevator. Alex is a painter and uses one of the rooms as his studio. Ruth is a retired school teacher. They have lived there so many years that it and the neighborhood have become intertwined with their lives. Their niece Lilly is their broker who believes the apartment is worth up to $1M. Three other plot lines develop simultaneously with the sale of the apartment. One is the problem with the Carvers' old dog Dorothy who gets a ruptured disc and the issue of how much money to spend to help her. The second is an ongoing news story about a driver of a disabled tanker truck, a supposed terrorist, on the bridge near the Carvers' apartment. The third is the Carvers looking at new apartments. The vet tells them that an operation costing $10,000 might fix Dorothy's ruptured disk. Alex is against it at first but later agrees with Ruth that they have to do whatever it takes to save Dorothy. After the operation, Dorothy is still unable to move her legs. Toward the end of the movie, while still under the care of the vet, Dorothy starts walking again. In their search for a replacement apartment, Ruth finds one she really likes, and their offer is accepted. However, the sellers' agent wants a deposit check that evening or it will go back out to bid. When Alex, Ruth, and Lilly arrive at the apartment to write the deposit, the owners tell them it's not enough. Meanwhile, the news reports that the driver of the tanker has been apprehended. Alex is startled that the driver is "just a kid". Alex does not like the owners' attitude and refuses to write a deposit check. Alex and Ruth leave. As they are leaving, Lilly finds out that the Carvers are no longer interested in selling their apartment. She flips them off and walks away. The film ends with Alex walking Dorothy up the stairs to their apartment in the winter. He sees a young couple moving in to their building, similar to when he and Ruth first moved in 40 years ago. On September 25, 2013, production was still in progress with some scenes being shot outdoor near the Myrtle Ave Subway Station in Brooklyn with both Freeman and Keaton. On September 27–28, Freeman and Keaton filmed a scene at BluePearl Veterinary Partners specialty and emergency hospital for pets in Midtown Manhattan. 5 Flights Up premiered at the 2014 Toronto International Film Festival on September 5, 2014. The film received mixed to positive reviews from critics. On Rotten Tomatoes, the film has a rating of 52%, based on 44 reviews, with an average rating of 5.7/10. The site's critical consensus reads, "5 Flights Up is a bit of a narrative fixer-upper, but when it comes to watching Diane Keaton and Morgan Freeman share screen time, you really can't beat the view." On Metacritic, the film has a score of 55 out of 100, based on 18 critics, indicating "mixed or average reviews". ↑ "RUTH & ALEX (12A)". British Board of Film Classification. June 26, 2015. Retrieved June 26, 2015. ↑ "5 Flights Up (2015)". Box Office Mojo. Retrieved September 4, 2015. ↑ Smarp (25 September 2013). "Morgan Freeman in Myrtle Ave, Brooklyn, NY, USA". Retrieved 25 September 2013. ↑ Smarp (25 September 2013). "Diane Keaton in Myrtle Ave, Brooklyn, NY, USA". Retrieved 25 September 2013. ↑ "Ruth & Alex". 2014 Toronto International Film Festival. Retrieved 17 August 2014. ↑ "5 Flights Up (2015)". Rotten Tomatoes. Retrieved 2015-09-04. ↑ "5 Flights Up Reviews". Metacritic. 2015-05-05. Retrieved 2015-05-31.